Sure, physical humor is timeless, but will modern audiences pay to see it? Hanging With "The Three Stooges"
"The Three Stooges" are back, resurfacing in an comedy era brimming with irony, hyper-meta sitcoms, mash-ups and Internet memes. Is there a place in your funny bone for slapping, eye-poking and nose-tweaking? Like every art form that matters, comedy has experienced a sea change over the past 40 years, as what’s considered funny has gotten smarter and more sophisticated. Shows like "Arrested Development" and "Community" have been so carefully constructed that woven into their weekly plots have been set-ups for jokes whose punch lines didn’t come until a year or two later. But “The Three Stooges”? It's still just three guys hitting each other over the head with a pipe wrench and poking each other in the eyes. The Farrelly Brothers, whose filmography thus far belies a strong debt to the original slapstick trio, sure hope so. And a lot of folks who make their living off laughs think the wise guys most certainly still are funny. Our first look at the Farrelly Brothers' attempt to revitalize the slapstick icons. Coming April 2012. Blake Anderson, of the Comedy Central series "Workaholics" (and big fan of Will Sasso, who plays Curly) says the Stooges' brand of funny stretches back to the dawn of man. "I know the stuff that I think's funny is just bare-bones dumb. I've always thought people like 'Jackass'—guys getting hurt At the end of the day, a kick to the nuts is what makes me laugh. It's probably been making people laugh since we were cavemen and I don't think it will ever change. The Stooges kinda harnessed that energy." Part of the Stooges' appeal is no doubt thanks to the fact that they demand nothing from their audience. When the Martians finally get here and start flipping through the dial, they'll be in on the joke. You don’t have to have read that day's paper, or Homer's "Iliad," or the Bible--everything is right there on the screen. Sean Hayes, Chris Diamantopoulos and Will Sasso chat about transforming into Larry, Moe and Curly, as well as how they prepared for the roles. 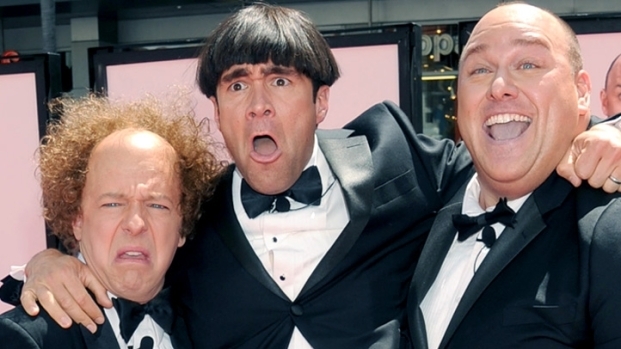 How did they react when they first saw themselves as "The Three Stooges"? "There's something timeless about it—it's not like you have to know the political context to appreciate it, you can see everything onscreen that makes up the joke," says Nate Dern, artistic director of Upright Citizens Brigade, the comedy troupe that was founded by Amy Poehler, Matt Walsh, Matt Besser and Ian Roberts. The Farrelly Brothers, Peter and Bobby, are banking on it this universal love of the dumb. It's worked for them before: The duo made a name for themselves creating some of the raunchiest, basest, slapstickiest and successful comedies of the '90s, with "Dumb and Dumber," "Kingpin," "There's Something About Mary" and "Me, Myself and Irene" combining to gross out millions and gross more than $400 million. But their last six films have fallen short of $250 million all together. Maybe things have moved on? Starring “MadTV’s” Sasso, Sean Hayes ("Will & Grace") as Larry and Chris Diamantopoulos as Moe, "The Three Stooges" opens with the three infant Stooges being left on an orphanage doorstep. Years later they must help scrape together $830,000 to save the orphanage from shutting down—as though the plot ever made a difference to these three. Not surprisingly, the effort to construct a 90-minute plot around their Stoog-ian hijinks proved to be a chore. The film is at its best when it's at its Stooge-iest. Hayes, Sasso and Diamantopoulos have the Stooges' look and voices down (Sasso has clearly been preparing for this his whole life). When the three of them engage in a classic punch-and-poke three-way with Moe on the pivot in the middle, it's its own form of idiotic magic. And when Moe finds himself a member of "The Jersey Shore," something about the cognitive dissonance of seeing them together is brilliant—or maybe it's just the thrill of finally seeing someone abuse those clowns. Penn Jillette, the talking half of Penn & Teller, is a magician with a comedian's wit, a vaudevillian's heart and the soul of a carney. The genius of the Stooges for him is in their outlaw status. "They are different in that they are aware that they are outsiders and that the world hates them, but they love each other," explained Jillette via email. "Characters who aren't trying to fit in, but stay outsiders and support each other kill me dead. It's all the Stooges ever were to me -- a pure definition of true friendship and 'To live outside the law you must be honest.'" It will be interesting to see how that plays with today’s Millennials. Born in 1984, Dern, the director of the Upright Citizens Brigade, is too young to remember when the Stooges were a staple of UHF television and is not a huge fan, but acknowledges their place in history. "I respect their work, I understand that they had a big influence on comedy, but I am not someone who went back and looked up old ‘Stooges’ sketches to watch," says Dern, while conceding that he has colleagues who bear their imprint. In particular, Dern points to 2 Fun Men, aka John Haskell and Arthur Meyer, a New York City-based duo who recently appeared on “Late Night with Jimmy Fallon”, doing a fake fight with sound effects. 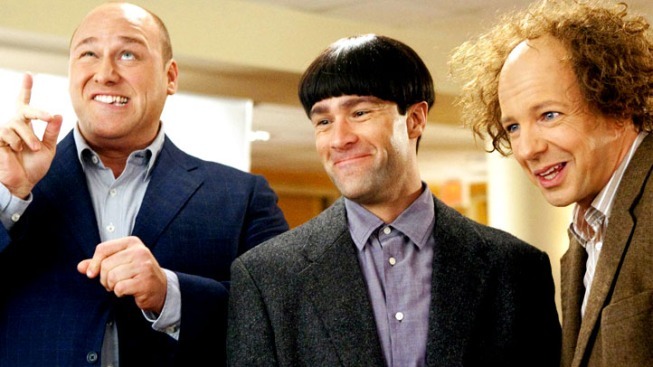 The bit owes an unmistakable debt to “The Three Stooges." Watching 2 Fun Men you can see that precision choreography that was the Stooges' hallmark. "When you do go watch (‘The Three Stooges’), you realize, this isn’t just stupid someone getting hit in the face with a pie—there is more to it," says Dern. "Everything's very precise and intentional, and like clockwork, how it all carries out. They were very, very good at what they did," says Dern. And yet, Haskell is totally unaware of the traces of Stooge in his DNA. “I don't really have any memories of the ‘Three Stooges’ or any way in which they influenced me,” said Haskell, who notes his uncles were fans. Maybe an even greater threat to the Stooges in 2012 is the ever more strident parenting that's becoming the norm. For all the complaints you hear about how coarse we've become as a society, we now live in a world where mothers contemplate banning ice cram from city parks. Will they have any tolerance for the relentless violence of the Stooges? "Would it fly today? That's an interesting question—I think it would," said Dern. "I think it would be refreshing if someone had a genuine Stooges act today." For Adam DeVine, one of Blake Anderson's "Workaholics" co-stars, the stakes for the Stooges are much higher than simple box-office sales. "God, I hope so, man. If the Stooges don’t succeed, we're doomed as a country."